Teaching children fractions is easy in the kitchen as meal times are when we apply fractions to our everyday lives. Whether we realise it or not every time we make sandwiches, cut up a cake or share out slices of pizza we’re using fractions. Here are some ideas you can use with children to introduce fractions in a fun and practical way, so that when they come to ‘learn’ fractions at school they’ll already be familiar and confident with the underlying principles. Make some sandwiches and cut off the crusts to make a clear square shape from your slices of bread. Help your child to slice up the sandwiches and talk about the shapes and fractions you make as you slice. Cut the sandwich in half to make two rectangles. Cut it into quarters and count the four smaller squares you have. Cut these diagonally into eigths and count the eight triangles you have made. Make a drink of juice and talk about how many parts of water and juice you need to mix together. Maybe you want to make half water and half fruit juice – measure out two equal halves and pour them together to make a whole drink. Maybe you need to use tenths and mix one tenth cordial with nine tenths juice. If you have a clear plastic bottle you can make lines on the outside with a permanent marker to divide the bottle up into tenths, to make the fractions clearer. Put your child in charge of splitting some fruit into fractions. If you have five people in your family your child is going to have to give everyone a fifth of a share from a bag of grapes. Let them line up five little bowls and put one grape (or blueberry or whatever) in each bowl, repeating until all the grapes are shared out, with a fifth in each bowl. Have some cake for pudding, cut into slices. How many slices do you have? How much is left after everyone has had a slice of cake – half? Three quarters? A third? Including talk about maths in your everyday play and activities gives your child lots of opportunity to play about with concepts, so that when they come to study them in a more academic way they already have the beginning of an understanding of the principles, and they will feel comfortable and confident in approaching maths. You are so right. There is so much math in everyday life…who needs a math text?? Very nice reminder of how simple math can be! Love when math is used in a real sense. You might enjoy some of the connections I made in our post http://traininghappyhearts.blogspot.com/2010/01/jammies-school-power-foods-lab.html a while back. Edible math is the best! Edible fractions,great idea 🙂 Thx for the links. 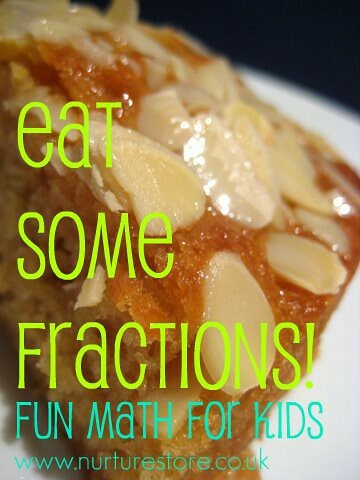 Edible makes fraction fun to learn cos we get to eat it! So yummy!! !